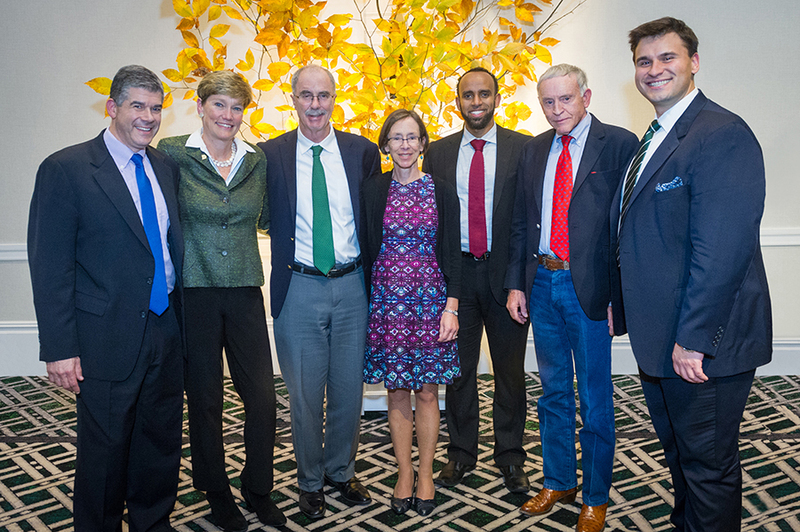 Dartmouth recognized four standout alumni volunteers at the annual Alumni Awards Gala on October 27. The recipients were presented their awards in Hanover during the 215th meeting of the Dartmouth Alumni Council. Sherri C. Oberg ’82, Tu’86 and Arthur M. Kelton Jr. ’61 were presented with the Dartmouth Alumni Award in honor of their long-standing and meritorious service to the College and their community, as well as achievements in their careers. Alumni are eligible for this award, established in 1954, after their 25th class reunion. Kevin C. Hudak ’07 and Heiyab F. Tessema ’04, Th’05, Th’06 received the Dartmouth Young Alumni Distinguished Service Award. This award, established in 1990, recognizes breadth, depth, and length of volunteer involvement. Alumni are eligible the first 15 years after graduation. Sherri ended up at Dartmouth after a detour on a family camping trip brought her to campus. “I thought it was the most beautiful place I’d ever seen,” she explains. “It was the beginning of a lifelong love affair.” A history major, she fondly remembers Professor Ken Shewmaker’s classes, his reenactments of historical scenes, and working with him on her senior seminar about Daniel Webster. Sherri was active across campus, participating in the Glee Club, in theater productions, and in Kappa Kappa Gamma. She was one of the founders of the all-female senior society Phoenix, and was also tapped for Fire and Skoal. An intern in the Office of Alumni Relations, Sherri learned the value of the Dartmouth alumni community early on. 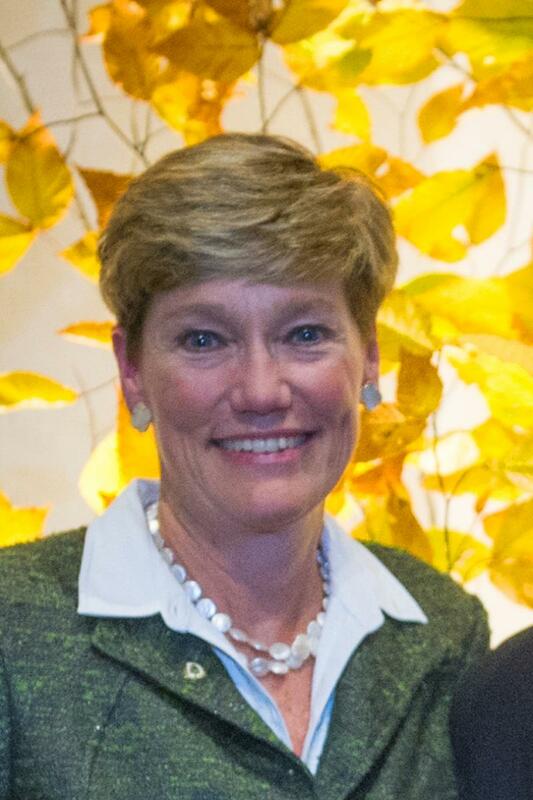 Upon graduation, she spent two years in a training program at Banker’s Trust before returning to Hanover to attend the Tuck School of Business. She focused her studies around the health care industry, and joined a venture capital firm after earning her MBA. Sherri quickly zeroed in on the biotech space, working in both New York and Boston before leaving venture capital to lead a troubled company as a turnaround CEO. “I discovered that as much as I liked being a venture capitalist, I loved being an entrepreneur,” she explains. Along with a scientist from MIT, Sherri founded Acusphere out of the basement of her house, which grew from “a blank piece of paper” to a company with 150 employees that invented a drug for cardiovascular disease and held a successful IPO. After 20 years as CEO, Sherri transitioned out of the role, and recharged by trekking in Nepal and working on a documentary that premiered at the Sundance Film Festival about the need for change in our educational system. Currently, she’s working with MIT scientists and the Gates Foundation on an effort to create technical solutions to global malnutrition. Sherri’s husband Curt is a member of the Class of 1978, and their children Ali ’13 Tu’18 and Eric ’16 both attended Dartmouth as well. Art nearly became a geography major before a conversation with then-chair of the history department and Dartmouth legend Al Foley convinced him to switch to American history. An avid skier, Art joined the freshman ski team, was a member of the ski patrol, and ran the College’s recreational skiing instruction program as an upperclassman, was held on the golf course at Oak Hill, and at the newly opened Dartmouth Skiway. Fascinated by politics, Art was the president of the Young Republicans, as well as a member of Alpha Chi Rho (now Alpha Chi Alpha) and the Dartmouth Forensic Union. After graduation, he worked for the governor of Vermont and earned a master’s degree in political science from the University of Vermont. When tired of East Coast mountains, Art packed up his car and moved to Colorado, where he taught skiing in Steamboat Springs and Vail. He worked for Olympic gold medalist Roger Staub, before “inadvertently” getting into real estate and then property development in the Vail area. “I still work for myself, I would never retire,” Art notes, adding that his office “is probably a minute and a half from the ski gondola, and not by accident. I still ski probably 90 days a year.” He also flies planes recreationally, is chairman of the board of a local hospital known nationally for its orthopedic program, and enjoys spending time with his wife Elaine and daughters Courtney, Vanessa, and Ashley and their families. Art learned the value of the bonds between Dartmouth students and professors early on. Professor Foley, who was an important mentor during Art’s time on campus, remained a source of Dartmouth connections long after Art left the Hanover Plain. “When I moved to Denver, he drove out with me and introduced me to all the Dartmouth guys in the area,” Art explains. Art remains tightly connected to his class, and served as class president for six years and head agent for two terms. He was a member of the board of overseers that managed the Hanover Inn during its renovation, and spent a decade on the now-disbanded real estate committee managing non-institutional properties for the College. He also spent a term on the Alumni Council. Art worked with Steve Waterhouse ’65 to create the Passion for Skiing film and book, exploring the history of the sport at Dartmouth. He has been deeply involved with the Dartmouth Club of the Vail Region, serving as president for the last seven years. Art has spearheaded the organization of a weekend celebration called CarniVail, held annually during the last weekend in February, which “combines the intellectual with the athletic.” The event includes a Friday evening celebration and a weekend of ski races. Art hopes to bring faculty to CarniVail to create an academic tie to the College. Dartmouth nearly lost Kevin to Georgetown – he was initially waitlisted at Dartmouth and planned to enroll as a Hoya. Luckily, he was admitted off the waitlist just as his family was about to leave for summer vacation, and a quick visit to campus convinced him he belonged in Hanover. Once on campus, Kevin began taking science classes for a premed track, but quickly realized that his passion was in the government department thanks to Professor Ronald Shaiko’s Government 3. He ended up spending a semester in Washington, DC on the Government Foreign Study Program (FSP) with Professor Shaiko, where students interned on Capitol Hill during the day and took classes at night. Outside of class, Kevin played club badminton, was involved with the Rockefeller Center’s Class of 1964 Policy Research Shop, and was a member of Sigma Nu (for which he served as vice president and president) and Paleopitus. 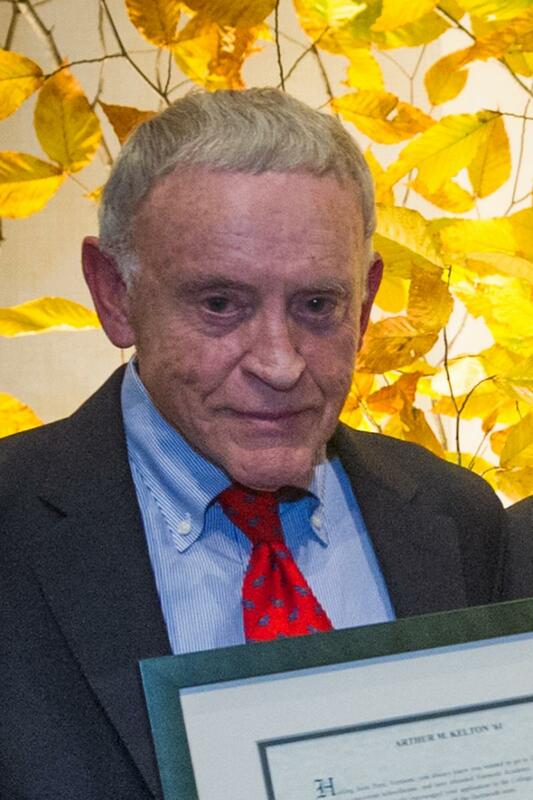 He wrote for the Dartmouth Review and helped manage the publication’s business side as President in his junior and senior years, bringing in significant funding and organizing several public forums around contemporary issues. After graduating, Kevin moved to DC to work at one of the nation’s most prestigious Republican polling and public affairs firms, The Tarrance Group. In addition to supporting dozens of state and local races, Kevin and the Tarrance team polled for more than 35 members of the U.S. House of Representatives, more than 7 U.S. Senators and several Republican campaigns for U.S. President. 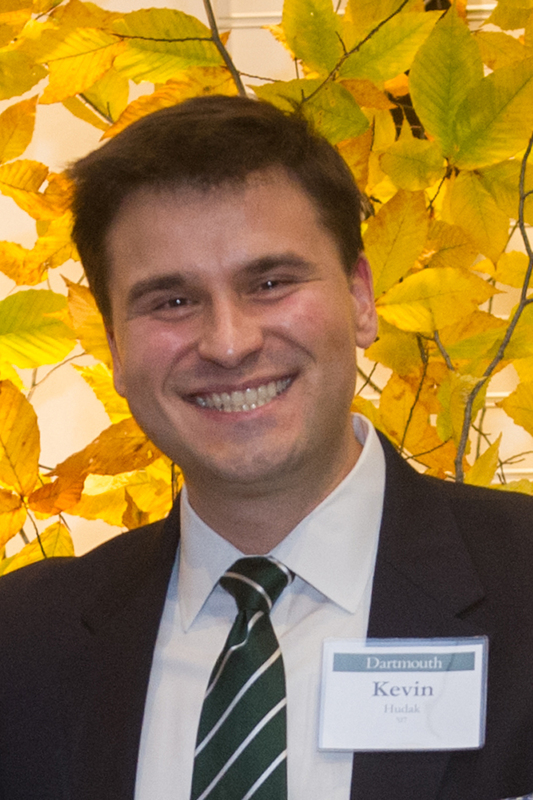 In 2011, Kevin joined Brightline Strategies as leader of the firm’s research and strategy practice, where he “applies the art and science of political polling to the corporate world.” He also founded a nonprofit called Single Parents of New York in honor of his grandmother, Gladys, which supported a scholarship for students of the high school in his hometown. Kevin was on the Senior Executive Committee and served as class mini-reunion chair for five years after graduation. Under his leadership, the class held 10 mini-reunions across the country each year, including an annual event at Homecoming complete with spiced cider and Lou’s pies. Kevin also helped organize his class’s five-year Reunion. He has served as an alumni interviewer since graduation, and has volunteered with the Dartmouth Club of Washington, DC since 2008. He started organizing trips to Washington Nationals baseball games for the Club, and quickly moved up to event planner, vice president, and interim president before being elected president two years ago. Throughout his time with the Dartmouth Club of DC, Kevin has chaired the Club’s annual Daniel Webster Dinner honoring a DC-area alumni in public service for two years, which most recently honored noted journalist Jake Tapper ‘91. He also remains involved with the Rockefeller Center and the First Year Fellows program. Heiyab spent six years on campus, earning an AB from the College and a BE and MEM from the Thayer School of Engineering. He noted his engineering modified with economics major was “really tough,” but it created enduring bonds between fellow students in the program. On campus, Heiyab was deeply involved in Alpha Phi Alpha Fraternity, Inc, a historically black fraternity, for which he notes that he “probably served in every role at some point.” He also served as vice president of the Dartmouth Afro-American Society and helped found the Inter-Community Council, which brought together the leaders of various campus communities to tackle common issues. Heiyab was part of a radio show “on Wednesday nights at some god-awful hour” and enjoyed playing intramural sports. He also spent time in Dartmouth Alliance for Children of Color (DACC), which provided opportunities for children of color from the Upper Valley to meet students of color at Dartmouth. 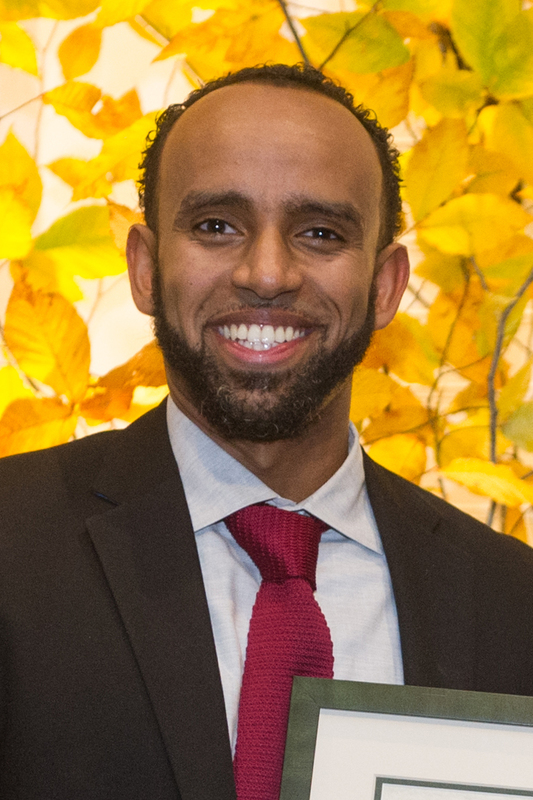 After graduating from Dartmouth, Heiyab worked as an environmental engineer in New York for several years before transitioning into building “faster-moving” tech, first at Agora Group and then at Oliver Wyman Labs, where he is currently an engagement manager working on data, analytics and software solutions. The child of Ethiopian immigrants, Heiyab also spent two years as chief operating officer of the Ethiopian Global Initiative, which sought to engage the Ethiopian diaspora in pressing issues. He also volunteers when he can for organizations working to close the opportunity gap for women and minorities, specifically in STEM.